At cafes and takeout windows throughout the island, coffee and conversation flow together like longtime amigos. In private homes, every host, however humble, offers the beverage. 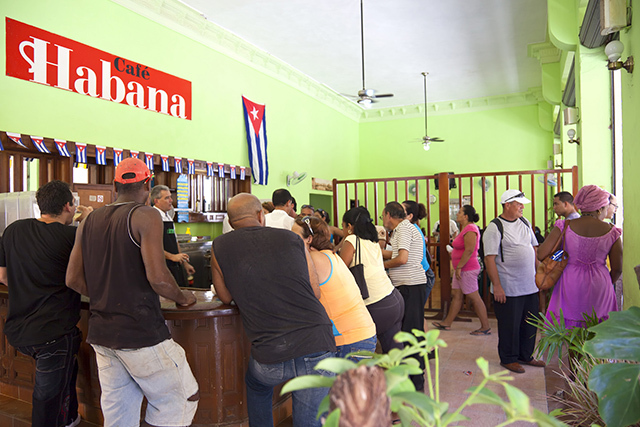 Seldom drunk in seclusion, coffee forms the cornerstone of Cuba’s social interactions. The flavor of Cuban hospitality is coffee. It’s so rooted in Cuba’s culture, it’s included in Cubans’ monthly grocery rations—in limited quantities. The black market is rumored to provide more. For customers who can’t afford that, chicharo, a bitter blend diluted with roasted chicharo beans (similar to chickpeas), still appeals to those who grew up with it during the island’s toughest times. The nation’s current coffee production may look like small beans compared to its robust heyday in the 1950s. Coffee came to Cuba by way of Santo Domingo in the 1700s, and French colonists fleeing the Haitian Revolution later introduced more-efficient production methods. By the early 1800s, Cuba sold more coffee than sugar. 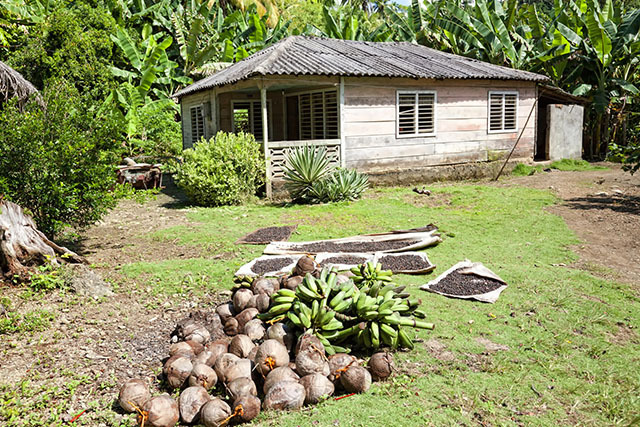 But Cuba’s Revolution, urban migration, an emphasis on food farming, and other developments eventually watered down the island’s coffee production. With President Obama’s historic announcement of renewed friendship between the U.S. and Cuba, interest in Cuban coffee is heating up. In June, coffee beans became eligible for import from the island to the states for the first time in more than fifty years. That’s a perk for Cuban exiles and coffee fans. Cuba’s climate is ideal for growing the beans, and its mountains—notably the Sierra Maestra and Escambray ranges—provide the perfect elevation. Farmers still harvest by hand and often transport sacks of beans by mule back. Cuban coffee is generally espresso, popular on the island since Italy began exporting espresso makers in the late 1920s. Because of its strength and scarcity, it’s typically doled out in small cups. Colada—meant for sharing—comes in a larger container with extra cups. A “cortadito” (or “small cut”) is made with steamed milk. Café con leche is usually presented black, with a separate cup of hot milk. “My mother used to regale me with stories of drinking very strong wonderful Cuban coffee pre-Castro,” says Kevin Sinnott, author of The Art and Craft of Coffee and creator and host of the CoffeeCon consumer coffee festival. You can use a traditional espresso machine or stovetop espresso maker, often called a moka, and generally used by Cuban consumers at home. Although most Cuban consumers likely used canned, pre-ground coffee such as Bustelo, there is no reason not to use fresh-roasted specialty coffee beans. In fact, in my kitchen, we only use fresh-roasted specialty beans. If you strive for authenticity, you may wish to use relatively dark-roasted Central or South American beans, although there’s no reason you can’t use dark-roasted beans from anywhere in the world. Grind beans fine for moka pots, extremely fine for espresso makers. Add a teaspoon of sugar into the moka’s carafe before brewing. If you’re using a true espresso machine, add it to each cup instead. Purists will insist the sugar is necessary only to counter the effects of often-used lesser beans, compounded by over-roasting, but I’m respectful of the recipe as practiced, and any I’ve had is done this way and is quite delicious. In my opinion, the use of better coffee only improves the flavor. The sugar is no longer a mask but actually a synergistic ingredient. Please tell me more about this type of coffee from Sierra del Escambray (Topes de Collantes).